Almost exactly a year to the day that I had a look at the Brompton Toolkit and said to myself that I wouldn't get it as I didn't feel I would need it as I always have my O Bag or saddle bag to store the tools needed for puncture repairs while out on the road. Last week Brompton released the UPDATED Brompton Toolkit. When Brompton first released the toolkit back in late 2012 there was a problem with the tire levers. 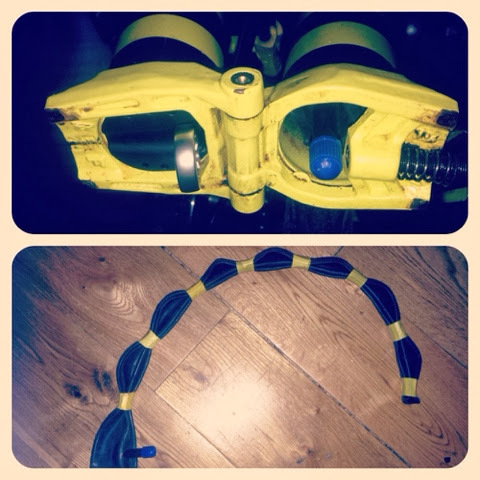 The original levers where constructed from 2 elements, plastic and metal. With this combination and the toughness of small tires the levers reportely broke when under the strain of taking the tires off the rims. Brompton stopped production and redesigned the tire levers. I fortunately was just about to buy said toolkit but decided to wait till after the redesign. 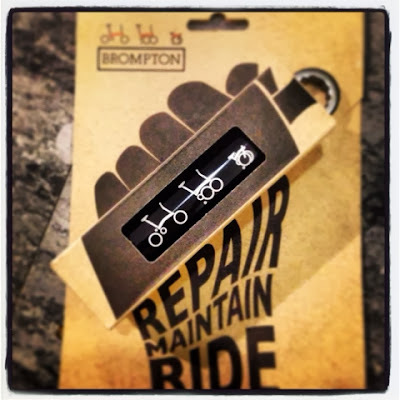 In this wonderfully designed little package is everything you would need to repair your Brompton when on the road. Now in addition to this I will have an Air Rush Regulator with CO2 cannisters & a spare inner tube. ALL of this doesn't necessarily need to go the saddle bag but could go into the main tubes of BumbleB when packed properly. With a thinner inner tube I'm hoping both inner tube & CO2 regulator CO2 cannister will fit. Only problem is that it cannot be used with Brompfication hinge clamps. I would be interested in checking item out, when it comes to the USA.